Some of the exhibits in the show are fascinating and highly valuable. Numerous drawings, photographs and models explore alternative futures for Sydney, many of which shed light on the city currently around us. 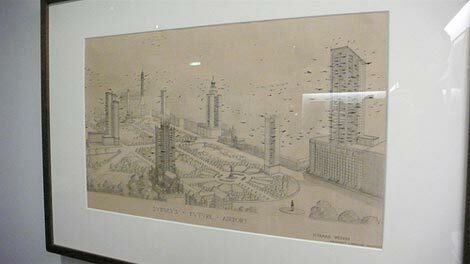 (A proposed new airport of towers for personal aircraft (“vertical dovecotes”), located on the corners of Hyde Park, is as viable as any currently proposed expansions of Kingsford Smith, given the gentle downward spiral of air traffic from now on, and rather more exciting.) 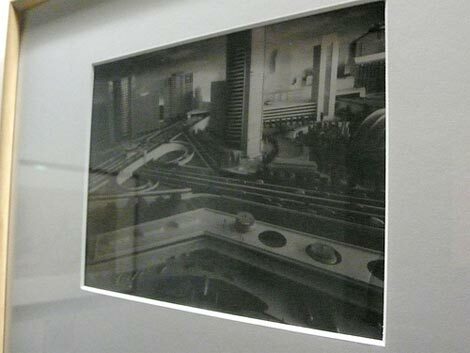 It’s useful to see sketches, and photographs of the models, for Seidler’s Australia Square and MLC Centre in particular, given their impact on Sydney. Also illuminating are some great photographs of Sydney's streets of the modern era, usually as the backdrop for fashion shoots or Holden ads. There is the nagging sensation that the show is focusing a little too much on Sydney. 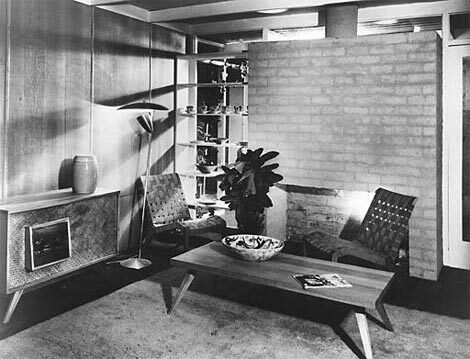 Melbourne is arguably often seen as the crucible of modernism in Australia, Canberra has perhaps the richest representation per capita, and Brisbane, despite its contemporaneous conservatism, has a fine tradition via the likes of Hayes & Scott through James Birrell and beyond. The show is due to tour to Melbourne’s Heide and the State Library of Queensland next year, so it’ll be interesting to see how it bends towards its hosts. There are three standout displays. 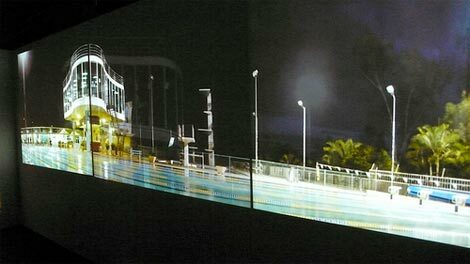 A large 3-screen rear projection of swimming pool architecture, in particular James Birrell’s supreme Centenary Pool in Brisbane, the elongated aspect ratio lending itself to the form perfectly, and supported by a relatively subtle audio backing. This is really rather beautiful. A reconstruction of Harry Seidler’s office, or at least a corner of it, is intriguing - rather more dry than the reconstructed Archigram office at the Design Museum exhibition a few years ago, but that may well be just one facet of the sizeable differences between Archigram and Seidler. 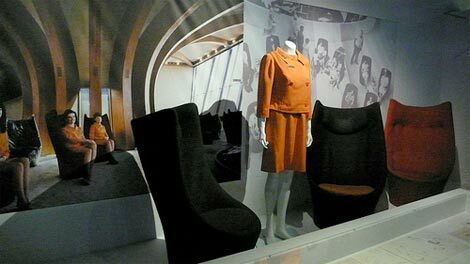 And a few of the Grant and Mary Featherston ‘sound chairs’ and costumes from Robin Boyd’s design for the Australian pavilion at the Montreal Expo in 1967 ends the exhibition, surrounded by flickering newsreel of celebs and royals visiting the installation. What really lets the show down is the exhibition design. Save for the aforementioned set-pieces it’s near non-existent. 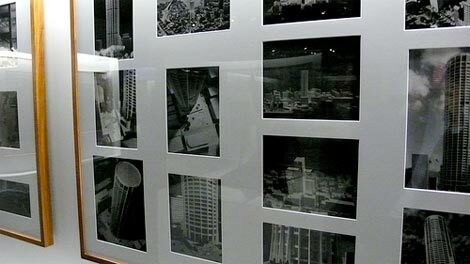 Most photos and prints are displayed in glass cases or framed on walls, and the lighting is too low throughout (surely one of the panoply of themes that a modernism show should engage with is the more basic experiential exploration of punching light through a more open plan?) 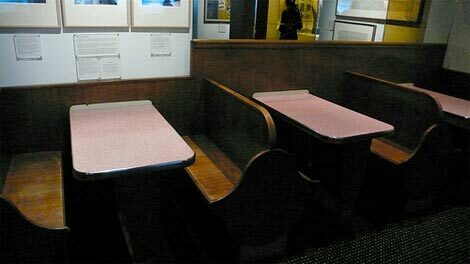 There's little that really addresses the ideas of the show in terms of the exhibition design, save for those set-pieces mentioned above, and a series of booths from a reconstructed milkbar. Anyone who’s been to exhibitions at any of the world’s leading museums and galleries in the last decade - and the crowd going to the Powerhouse for a modernism show can be assumed to be fairly savvy in this respect - will know that the design of the show isn’t simply about mounting a display; it is an exhibit, a cultural artefact, in its own right. Personally, I’m thinking of several shows at the Pompidou in Paris in particular, or several at Tate Modern, Barbican or Hayward Gallery in London, or the 21:21 Design Sight gallery in Tokyo, or several in NYC. Yet small galleries in Zürich, Amsterdam, Barcelona and others indicate you don’t have to be a world city gallery. 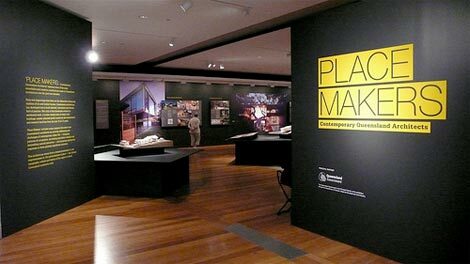 Having said that, I’ve sat through enough recent NSW State Government presentations indicating Sydney’s placing in various ‘quality of life’ surveys (usually in the top 10, and often ahead of cities like Paris) - if Sydney is really up there, then there’s no reason that its largest public museum shouldn’t aspire to punch its weight. With that ambition, and commensurate budget, perhaps a fuller version of the Seidler office could’ve been reconstructed outside the building? 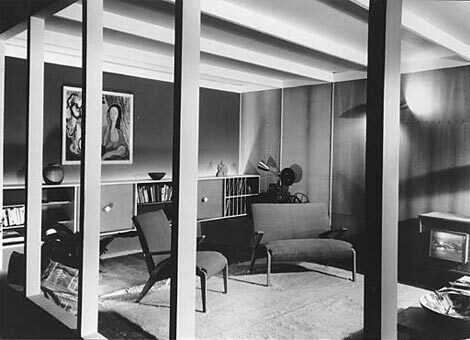 Robin Boyd’s 1949 'House of Tomorrow' could have been rendered more fully, at least room by room, adorned with Grant Featherstone’s furniture (London's little old Geffrye Museum provides a decent precursor here). 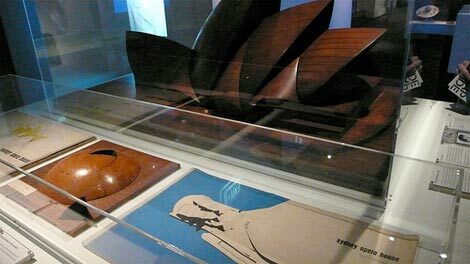 Could not the entire Montreal Expo 67 Australian pavilion by Boyd have been reconstructed, with replica Featherston sound chairs talking away, enabling visitors to really begin to feel the spaces? I'm fully aware of not wanting to focus too much on built forms when attempting to conjure the social and cultural patterns at play during the modern era, so exploring these ideas in other media might layer further meaning. 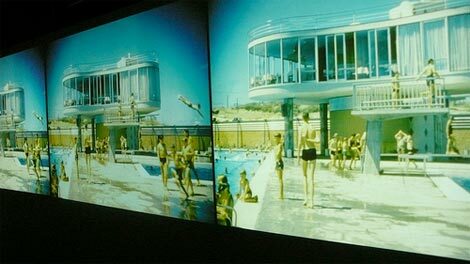 Perhaps a series of specially-commissioned films or other installations could add context to the artefacts? 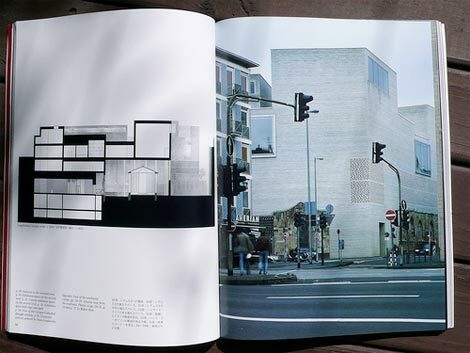 Maybe an information design approach to the themes, as with of 010's Metropolitan World Atlas, or various MVRDV titles. The building doesn’t help. A labyrinthine interior, difficult to read, the areas of the Powerhouse remaining for shows like this aren’t really appropriate for, well, a show like this. It almost intrinsically conveys the sense that the vast proportion of its collection is in archive at any one time, which isn't necessarily a good feeling when you’re in an exhibition there. Yet this is hardly something that can be a ‘quick fix’, nor something to which the current adminstration can be held responsible. And while it might be worthwhile considering how to remodel the space, there are some strategies that could be enacted to extend the exhibition in the short term either way. 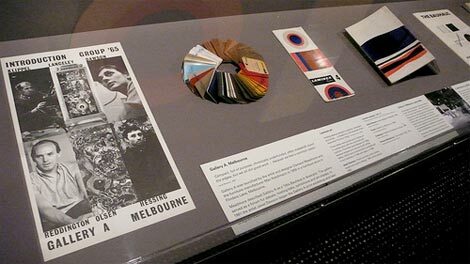 Five years ago, after visiting the ‘Art Deco’ exhibition at London’s V&A (which has now washed up on the shores of Melbourne, incidentally), I wrote about extending the exhibition into the city. I’d make exactly the same recommendation here, on the same premise. With ‘Art Deco’ and London, the city itself offered up numerous examples of the style, ideas, originating context and resulting reactions. I wrote the post before the mainstream existence of smartphones with 3G and GPS, or user-generated, collaborative Google Maps and the like, though I did suggest that they'd be good examples of what to create. Yet simple fold-out maps would’ve done, marking and describing examples of art deco in concentric rings around the V&A, and handed out to those who leave the exhibition inspired by the subject matter and ready to see more. 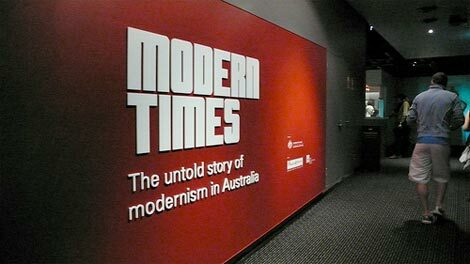 With modernism and Sydney - and the other Australian capital cities - this is another golden opportunity to extend an exhibition into the city. As well as the Google Maps, walking tours and audio guides, I'd advocate marking up buildings in the city i.e. fix temporary plaques outside the MLC Centre, Rose Seidler House, El Alamein Memorial Fountain, NGV etc., which offer up a short note about the structure and indicate they're part of a major exhibition around modernism in Australia. 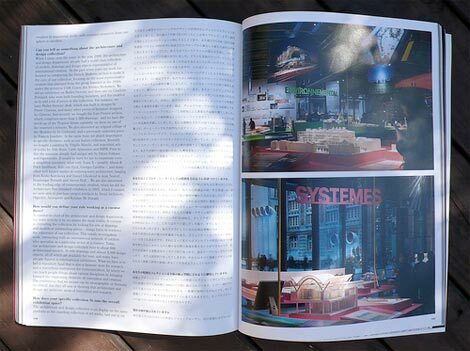 In this way, the exhibition is distributed, each building is adopted to become a node threaded into a wider network, each small plaque strung together thematically, connecting structures across cities and pulling the ideas of the glass cases. 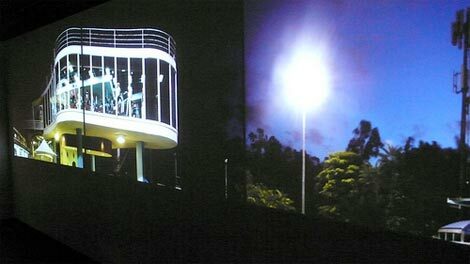 Of course, the digital layer could be even more detailed - smartphone-based in particular; featuring audio, like the recent ‘Unbuilt Melbourne’ project, or even, video and phone camera-based augmented reality - but these simple analogue interventions would also be interesting, discreet and more widely accessible. Plaques (analog or digital) could indeed denote unbuilt projects too, or the converse of that - ruined spaces, like the laneways cleared to enable the MLC Centre, discussing the impact of the modern era of urban planning. 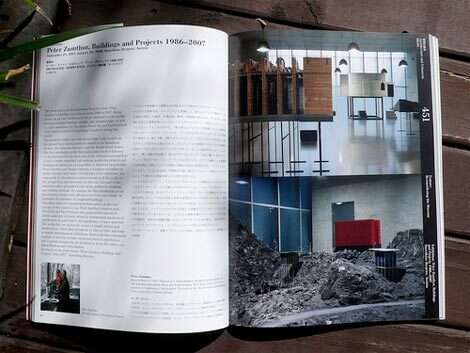 And perhaps most of all, and putting things in even sharper relief, an edition of Japanese architecture and urbanism magazine A+U from a couple of months ago (picked up at the extraordinarily good Kinokuniya bookshop here in Sydney) focuses on ‘Reconsidering the museum’, with detailed discussion of architectural exhibitions from the world’s leading curators. Actually, the presentation here is often relatively traditional in format, yet it’s executed with such rigour, craft, imagination and ambition. 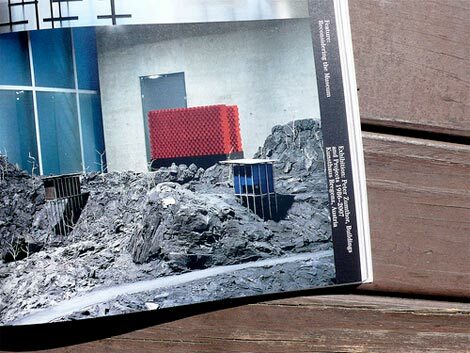 In particular, look at the extraordinary exhibition of Peter Zumthor’s work at the Kunsthaus Bregenz, with these models of Zumthor’s buildings situated in reconstructed landscapes, or on tables mounted at eye-level. 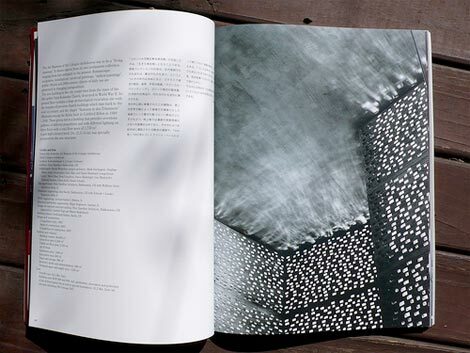 And in particular, in the commissioning of two filmworks exploring ideas in Zumthor’s work, displayed in a dedicated space for audio-visuals. 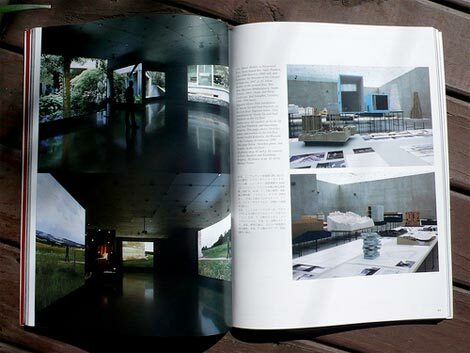 This show also indicates how to deploy darkness - for the video installations - amidst light. Elsewhere, we hear from the curators of the Miami Art Museum, Museum of Contemporary Art LA, Canadian Centre for Architecture, Cité de l’Architecture, Centre Pompidou, Louvre-Lens, Tate Modern, Serpentine Gallery, Austrian Museum of Applied Arts + Contemporary Art, Amsterdam Centre for Architecture, and others. The issue, as is generally the case with A+U, is worth tracking down. 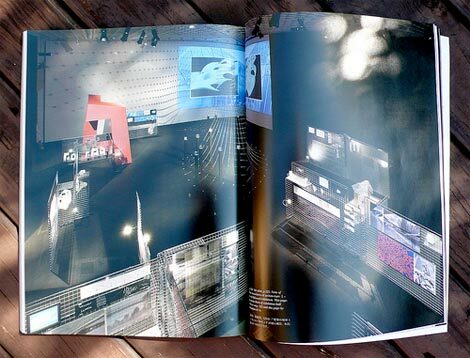 It sheds new light onto the issues, possibilities and best practice in displaying architectural exhibits. 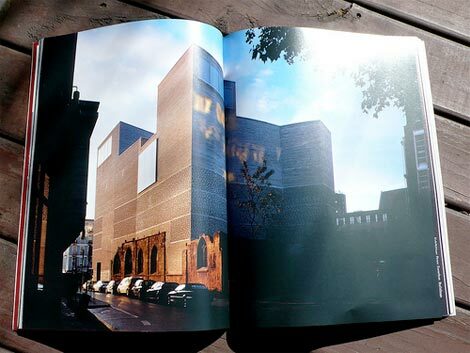 Save a few examples (Morphosis at Pompidou and the Koolhaas/Balmond collaboration for the Serpentine etc.) 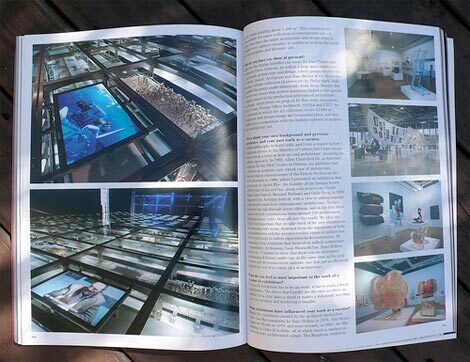 it doesn’t necessarily discuss the different formats and ‘distributed exhibition’ ideas above, but observing the quality of thinking and execution in ‘reconsidering the museum’ indicates numerous ways forward for exhibitions about architecture nonetheless.